Local nonprofit CommUNITY wants to let neighbors know they care. Katie Boon cuts steadily away at the fabric. Two and a half years ago, a group of seven friends came together at the Wegmans in Moorestown. They all shared a desire to give back to their communities and wanted to do more than just talk about it. They sat down and began to figure out ways to help. Thus, local nonprofit CommUNITY SJP was born. The volunteer-driven nonprofit’s goal is to “promote civic engagement and greater cross cultural understanding” through community service projects and social events in the South Jersey and Philadelphia region. The group regularly hosts events in Burlington, Camden and Gloucester counties, as well as Philadelphia. 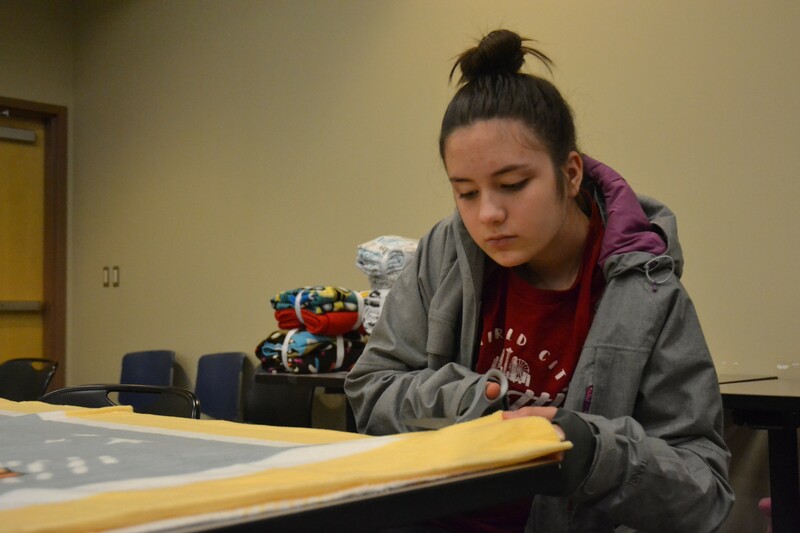 On Saturday, Jan. 26, the group came together at the Moorestown Library to assemble no-sew fleece blankets to distribute to local shelters and families in need. The project marked the latest in a series of service events. To date, CommUNITY SJP has provided more than a thousand meals for the hungry, made welcome bags for newly arrived refugees and assembled care packages for migrant workers. Hafeza Shaikh, one of CommUNITY’s founding members and a Moorestown resident, said once they got to work, they rapidly realized just how many ways there are to give back. She said their philosophy is to think globally and act locally. 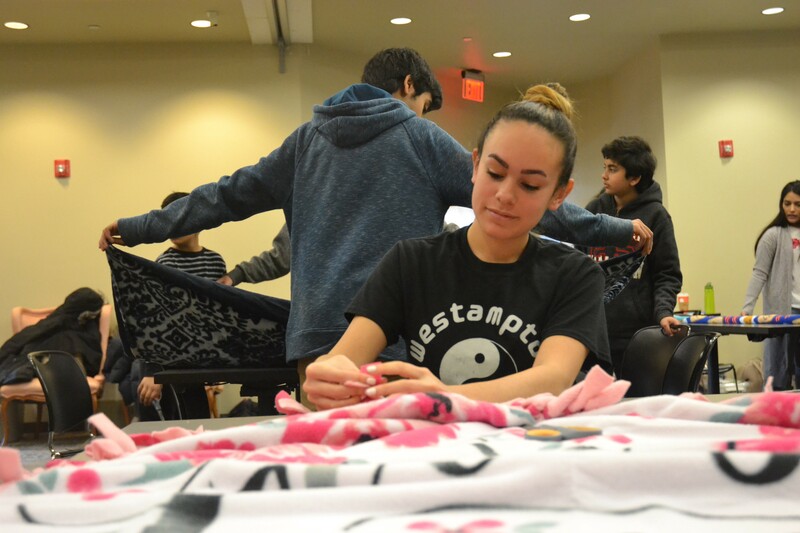 Local nonprofit organization, CommUNITY SJP held a blanket-making event on Saturday, Jan. 26 at the Moorestown Library. The group made no-sew blankets to donate to local shelters and families in need. They come to their next project largely by word-of-mouth. Shaikh said they hear about where there is a need or where a community may be in need of support, and they try to find ways to make a direct impact. One of their first projects was meal making — a project they have continued to do on a monthly basis. Fellow co-founder and Moorestown resident Lena Rasheed-Siddiqi said all of their projects are low budget. They use an online sign-up genius through which volunteers can offer to bring a variety of supplies to the events. Their events are targeted at all ages. Shaikh said before starting CommUNITY, they were hard-pressed to come across community service projects that were open to all ages. She said as a mother herself, she found it difficult to find the time to do a community service project if she couldn’t bring her children with her. Children or young adults may not be able to volunteer at soup kitchens, but through their projects, they can do hands-on activities like meal packing or weaving a no-sew blanket. Rasheed-Siddiqi said the no-sew blanket event at the Moorestown Library came together through word-of-mouth. She said given the cold temperatures, they knew local shelters would be in need of items like scarves and blankets. Rather than go out and buy them, they purchased fleece at a minimal cost and showed volunteers of all ages how to cut, weave and assemble blankets, which later made their way to daycares, homeless shelters and assisted living facilities. The group regularly collaborates with other nonprofits, and it hosts its events in a variety of spaces, including libraries and private homes. Because the projects are intended to benefit all types of communities and populations, they are always looking to attract volunteers and are open to fresh ideas. “If you have a project in mind, we’ll help you,” Shaikh said. Shaikh said their care packages often include notes letting the recipients know the items are from their neighbors because, at the end of the day, their goal is a simple one: to let their neighbors know they care. The group’s next monthly meal packing project will take place on Feb. 10 at 11 a.m. For more details or to get involved in one of their upcoming projects, visit http://communitysjp.org.